What are Microsoft Software Assurance Training Vouchers? 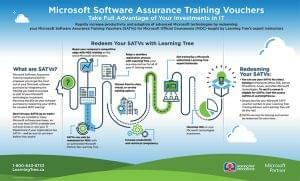 Microsoft Software Assurance Training Vouchers (SATV) empower you to get the most out of your Microsoft software purchase by integrating the training you need to succeed as part of your Microsoft technologies investment. How do I get Microsoft training vouchers? You probably have Microsoft training vouchers available to you now and don't know it! Why Redeem Your Microsoft training vouchers with Learning Tree? What kind of training can I get with my Microsoft training vouchers? How do I redeem my Microsoft training vouchers? Simply provide your Microsoft SATV voucher number, company email address, and voucher expiration date to your Learning Tree Training Advisor, and Learning Tree will do the rest! Not sure if you have a Learning Tree Training Advisor or how to contact them? Simply submit the form on this page to have an advisor follow-up with you. Learning Tree now accepts SATVs for exam vouchers. Don’t let your training vouchers go to waste! Learning Tree offers 90+ Microsoft Official Courses to meet all your Microsoft technology training needs. Click below to see our list of courses that are eligible for Microsoft training voucher redemption. Got Questions about Microsoft Training Vouchers? You’ve got the keys to advance learning. Simply complete the fields below to indicate your interest and we’ll be in touch!